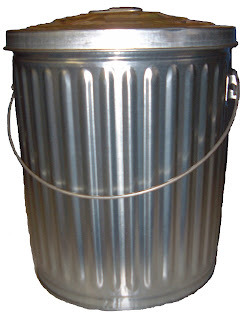 These cans are carefully manufactured in the USA from prime, heavy gauge galvanized steel, and feature deep body corrugations for superior strength and durability. The high strength handle can be raised to lock lid. Keeps seed dry and secure. Works great for up to 40 pounds of seed. Top Diameter 15¼"; Height 17¾"
It features a wide mouth for scooping and a narrow funneled end for pouring. The funnel doubles as a handle, which makes the transition from scooping to pouring quick and easy. Is there a length of time bird seed can be stored and still be edible? Foods will generally be fine for at least 3-4 months if stored properly. All foods should be stored in a cool, dry place –during the fall and winter, the garage is often the best place. Wild Birds Unlimited has closed steel containers that work well to protect seed from unwanted seed thieves or bad weather. Don’t just dump new seed on top of old. It’s best to keep the seed in its original bag to make sure the older seed is used before you open a newer bag. What's actually more important is how long you let food remain in feeders. In the rainy fall, at the very least, feeders can get clogged with wet seed and at worse the seed could be moldy and cause the birds sickness. So, in between rain drops, take a quick peek at your feeders, especially your goldfinch feeders, and toss out any moldy seed, suet, fruit, or nectar, and make sure your feeders are clean. Remember, birds give us a lot of pleasure as we watch them eat, so let’s provide them a safe and clean feeding station at all times. Feeders should also be cleaned at least once a month, year round. 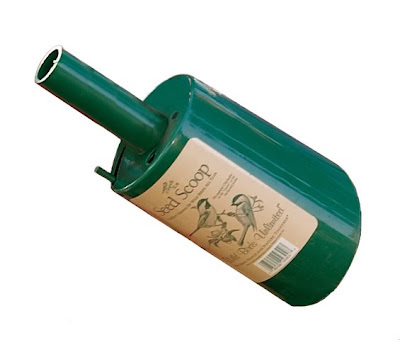 Wild Birds Unlimited - East Lansing - will clean your feeder for $5.00. Or you can purchase professional cleaners like Scoot at Wild Birds Unlimited, or use a mild one part vinegar to nine parts water solution to clean all of your feeders. Disassemble feeders and immerse them completely for three minutes. Scrub with brushes (we have these too), rinse thoroughly, and let air dry. When I choose a new feeder I always look for something easy to clean and fill. If you keep these measures in mind, you can keep this hobby enjoyable for your family and safe for your birds.